Most social media monitoring tools track mentions of your brand and then score whether the sentiment is positive or negative. But how do people position your product in their minds? What connections do they make? And how should you respond in ad messaging? 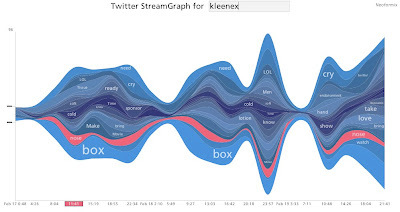 Data visualization guru Jeff Clark has created four tools that give new insights, including the Twitter StreamGraph shown above. StreamGraph shows the last 1,000 tweets about a term with the other words most closely associated with it, with waves denoting the frequency of each mention. Kleenex brand managers, for instance, obviously know their product goes with colds and noses, but the concurrent waves of “movies” and “men” might give them new ideas for ad messaging. Scott Berinato at HBR notes that such data visualization tools are still in their infancy. Or maybe not. We have to wonder what the boys behind the Facebook curtain are doing with all our pokes and Farmville messages.